Crafting, gardening, baking, learning... everyday life of Mama Polly and little E.
Cut one of the tubes in half so that you'll have one tall duck and 2 shorter ones. Smother the outside of each tube in glue. Paste on some yellow crepe paper. 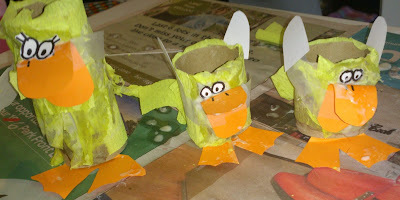 Cut some smaller pieces of crepe paper and glue a few to each duck for tail feathers. On the orange card, draw 3 pairs of feet and 3 duck bills. Cut them out and draw some nostrils with the black marker. Tape feet and bills onto your ducks. On the white card, draw 3 pairs of eyes (using black marker). Cut them out and glue them onto your ducks. On the white card, draw 3 pairs of wings. Cut them out and tape them onto your ducks. E enjoyed this craft. She loves gluing things and she loves ducks. She even got to practice cutting with scissors. She later drew a pond for her ducks to play in. This looks like fun! I might try it with Charlotte! Wife and mother; enjoying life with daughter, E, and 'the baby'.